Whether you're looking for one for yourself or to give as a gift, keep reading to discover where to buy wine decanters from the simple and elegant to ones that are a little out of the ordinary. You may have heard in the past that every wine needs to be decanted. This isn't necessarily true and simply pouring wine into a different vessel other than the bottle it's in, isn't necessarily decanting. There are all sorts of reasons as to why people decant their wine, the main reason being that it allows the wine to breathe or aerate. The truth of the matter is, most wines are perfectly fine straight from the bottle to the glass. It's the older vintages that really need decanting. Older vintage wines have sediment on the bottom of the bottle. This sediment isn't a bad thing, just the wine showing its age a little; but, you certainly don't want it to end up in you or your guests' wine glasses. To prevent that from happening, a bottle is decanted. Additionally, wine that has been bottled up for a number of years needs to breathe. As soon as the wine touches the air, it begins to oxidize. Though oxidation is like a four letter word in the wine world, a little bit of air is necessary to mellow out big wines and to allow it's bouquet and flavor characteristics to open up a bit. There are, of course, other, more simple reasons as to why people like to decant their wines. For instance, the decanter looks nicer on a formal table setting or maybe the hostess doesn't want to reveal that she's chosen a $10 bottle of wine over a more expensive bottle and doesn't want her guests to know. Although many believe good, cheap wine is something to be celebrated and shared, not everyone feels that way. If you're in a hurry or just a little anxious to enjoy your glass of wine, all you have to do to decant is simply pour the bottle of wine into the decanter very slowly. When you see the sediment reaching the neck of the bottle, simply stop pouring, set the bottle down and wait for the sediment to sink back down to the bottom of the bottle. If you truly want to do it correctly, you pour the bottle while it's lit from behind by some sort of light source, like a lighter, flashlight or candle. The light allows the pourer to better see the sediment and stop the flow of the wine before the sediment falls from the bottle and makes its way to the decanter. 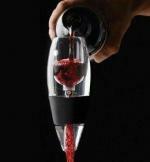 Wine Stuff - This site has decanters by Riedel, Ravenscroft, Spiegelau. While there, you might also want to check out the decanter accessories like funnels, washing brushes and drying racks. 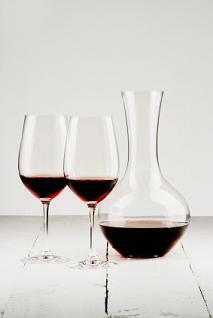 Amazon - Amazon has just about everything, including some really cool decanters at great prices. Decanters.com - Check out the cool decanters by Peugeot at this website. They also offer a whole host of wine related items like openers and coolers as well. Bar Parts - This website has a large selection of Venetian Crystal decanters in all sorts of different shapes and sizes. Cooking.com - Offers decanters in prices ranging from the relatively inexpensive Nadia Riserva by Bormioli Rocco to the very expensive $315 Amadeo by Riedel. If you aren't into drinking very old, very expensive wines and want a decanter simply because it looks nice, go for a less expensive one. If you are into drinking very expensive and very old wines often, go for a more expensive decanter so it will withstand heavy use. As always, wash the decanter properly, by hand and if you don't want any film water residue or spots. Consider purchasing a drying stand especially made for these vessels of wine.